Ants have been on the planet for at least 100 million years. These industrious, social insects live in large groups and are seldom seen by themselves. That means if you find one in your garden, there are a lot more of them that you haven’t seen yet. Getting rid of ants in the garden is a simple process that requires only a little know-how and patience. Mix 2 tablespoons of finely minced garlic with 1 cup of hot sauce in a spray bottle; fill the rest of the bottle with water. 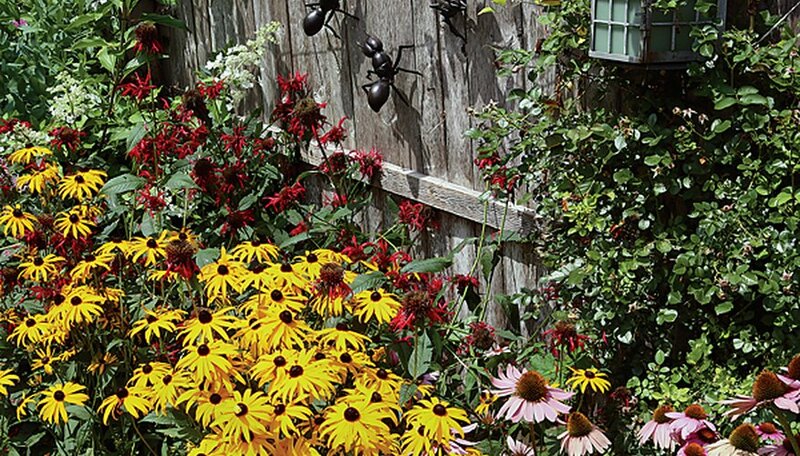 Spray around plants and around the garden's perimeter. Ants should begin to flee immediately. It may take more than one application, but within a day or two ants will be gone. Sprinkle polenta or dry grits around the garden. The ants will take this back to their nest and it will kill them quickly, as they are not able to digest it. Make sure that the ground is dry first; wet polenta or grits will expand and loose the desired effect. Sprinkle baking soda around the garden. Baking soda is poisonous to ants, but it won’t harm your garden. Combine 1 cup of water, 1 tablespoon of sugar and 1 tablespoon of borax. Dip cotton balls in the solution and set them around the garden. The sugar will attract the ants, and the borax will kill them. Sprinkle fresh, unused coffee grounds around the garden; the ants will take it back to their nest and it will kill them. There are numerous commercial ant killers available at home improvement stores, but many are harmful to animals and plants, so read the labels on them before using. Vinegar is harmful to ants, but it also can kill plants. In addition, it can raise the acidity level in the soil, which isn't good for many plants.